Helloween is gearing up to release their 15th studio album, My God-Given Right, but that is not the only thing the band is celebrating. This year will also be the 30th anniversary of Helloween’s 1985 debut album, Walls of Jericho. My God-Given Right also marks the first time the band has released five consecutive albums with the same line-up; one that includes co-founders and remaining original members Michael Weikath (guitar) and Markus Grosskopf (bass). My God-Given Right is Helloween’s seventh studio album produced by noted power metal producer Charlie Bauerfiend. It also denotes the band’s return to Nuclear Blast Records after their departure in 2003 after the release of Rabbit Don’t Come Easy. “Heroes” is My God Given-Right’s energetic opener. It instantly boasts powerful, modern guitar riffs from Michael Weikath and Sascha Gerstner. The positive lyrics, “Everyone can be a hero / We are, we are / Sometimes up and down to zero / We are, we are heroes,” are about everyday people fighting their way through life. At first I thought the rhyming of “zero” with “hero” was a little predictable and cheesy, but the song is so good, I didn’t care. Following “Heroes” is the album’s lead single, “Battle’s Won”. There is a soaring metal scream from singer Andi Deris in the intro. “Battle’s Won” features accelerated guitar riffs, as it is quite a bit faster than the previous track. The chorus beginning with, “Stand tall, your battle’s won”, is bright and uplifting. It has a regal air about it, and the subtle hints of trumpet or synthesizer make it sound even more so. "Lost in America" is the second single from My God-Given Right. Andi Deris’ vocals in the intro are full of attitude, and I love it. "Lost in America" has some great guitar riffs, and the song contains a nice mix of modern and classic metal sounds. It has a big, theatrical chorus, and it takes more of a classic power metal turn during the guitar solo. The song’s title and lyrics were inspired by an event that happened to the band. Years ago on a flight, there was an issue with the plane, and the pilot had to return to the airport. The guys in the band were just stuck on the plane, left to drink and wonder where the hell they were. They were “Lost in America” and afraid they wouldn’t make it to their next show on schedule. It’s pretty cool that Helloween had a bit of a Spinal Tap moment through no fault of their own, and they were able to make a great song out of it. Title track "My God-Given Right" is highly rhythmic and has a bit of a speed metal edge to it. The drumming on this one from Daniel Löble is excellent, and it really stands out. The lyrics are about it being a "God-given right" to stand up and fight for what you want and what you believe in. You don’t have to just sit back and be passive in life. While it is brief, there is also a prominent bass solo from Markus Grosskopf after the guitar solo. “The Swing of a Fallen World” is a darker, slower track that doesn’t fit the mould of most of the album. It’s not a typical power metal song, except for the guitar solo portion. Andi Deris’ vocals are not as clean and polished here either. While it isn’t the usual Helloween fare, “The Swing of a Fallen World” is one of my favourite songs from My God-Given Right, and the memorable rhythm really hooks you in. “You, Still of War” is the album’s grand finale and longest track. It is slow in the intro, and as the guitars are added, it is still somewhat slow. But as it builds up, the riffs become much heavier and more bombastic. The drumming becomes a rapid blast beat like a machine gun, and the song reaches full speed at the chorus. “You, Still of War” features the only real overt use of synthesizer on the album. The guitar solo sticks very much to the classic power metal side of things, but the rest of the song is more diverse in style and speed. 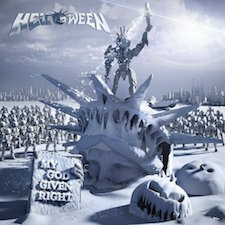 Helloween’s My God-Given Right is a marvellous collection of songs. No song on this album is worth skipping, and tracks such as "Russian Roulé", "Claws", and "Living on the Edge" should not go unmentioned. Helloween are without a doubt metal legends, and My God-Given Right is proof they are as relevant as ever, even after 30 years, a couple of less than stellar records in the ‘90s, and major line-up changes.